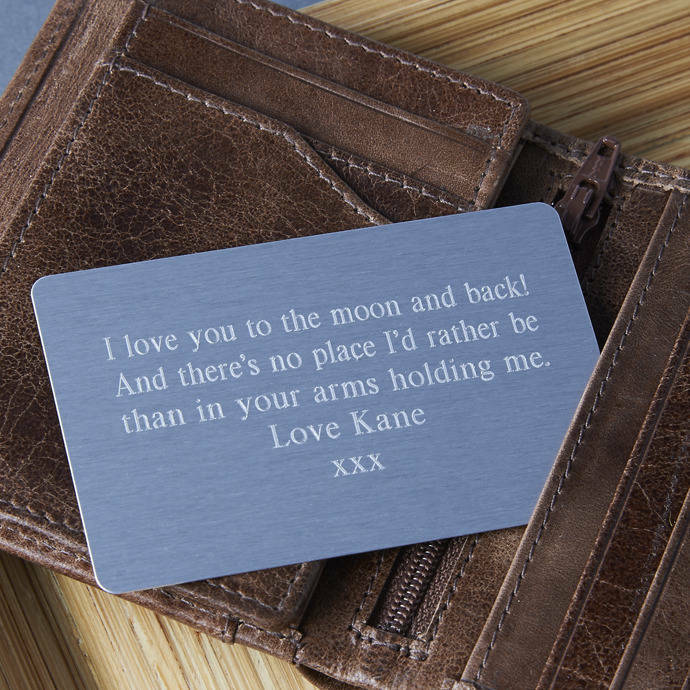 Gorgeous personalised keepsake metal wallet insert makes a great idea for a gift for a loved one. 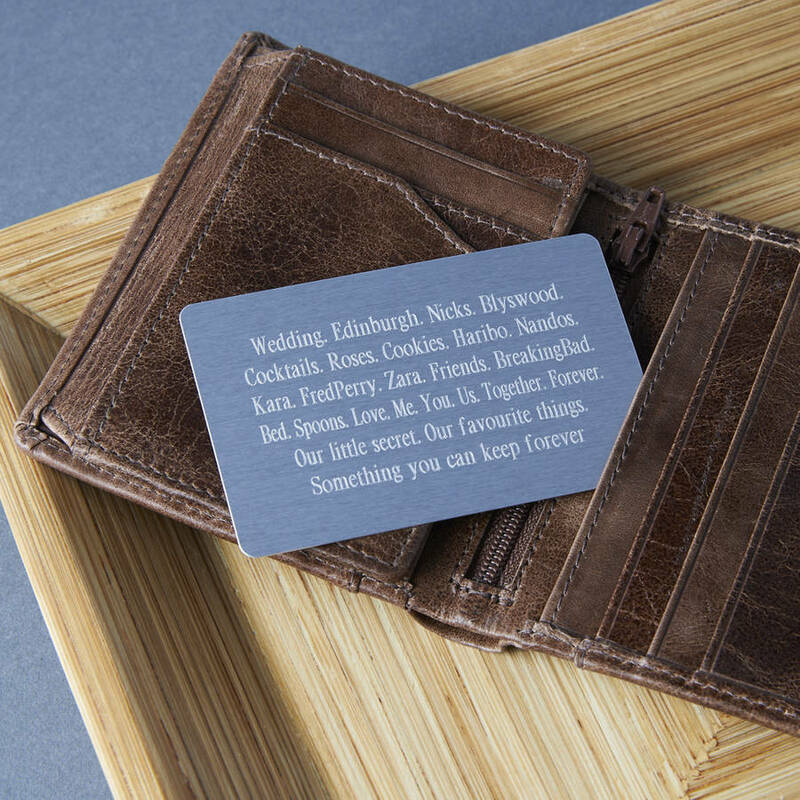 Give the gift of words with this truly unique, engraved credit card-sized aluminum insert. Whether for your spouse, partner, parent, or just a friend, it is the perfect gift to remind someone how much you care. 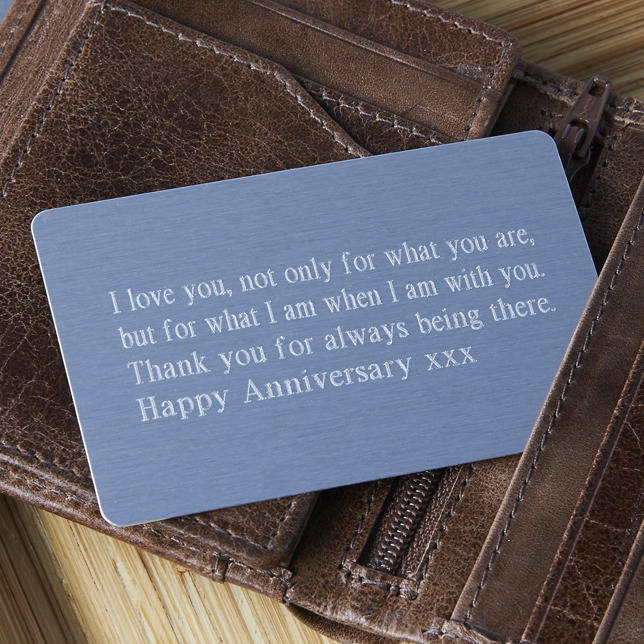 Just the size of a credit card - this personalised keepsake can always be tucked away safely in a wallet, purse or pocket. Your gift will always be with the one you love. "My best friend, even if we are not always near each other, know that I am loving you more and more every day." "There is no place I’d rather be, than in your arms, holding me." "Today is the day that I love you the most." "No matter where you are, I’ll always be with you. I love you." "Loved you then, love you still, always have, always will. Happy Anniversary." "30 May 2015 - Today I'll become your wife and you'll be my husband." "Always remember... It’s you and me." "You are my best friend, and I thank God everyday for you and our wonderful life we have together!" You can choose your own message, and remember it can be a message to any loved one and could also be written from child to parent so could make a lovely new mum or new dad gift. The choice is yours! Here at Suzy Q we really want your gift to be absolutely perfect, and if we spot misspellings we like to correct them! So please, if you have any unusual spellings of common words, or you’re using a play on words, please let us know! We will automatically correct text unless you tell us not to! 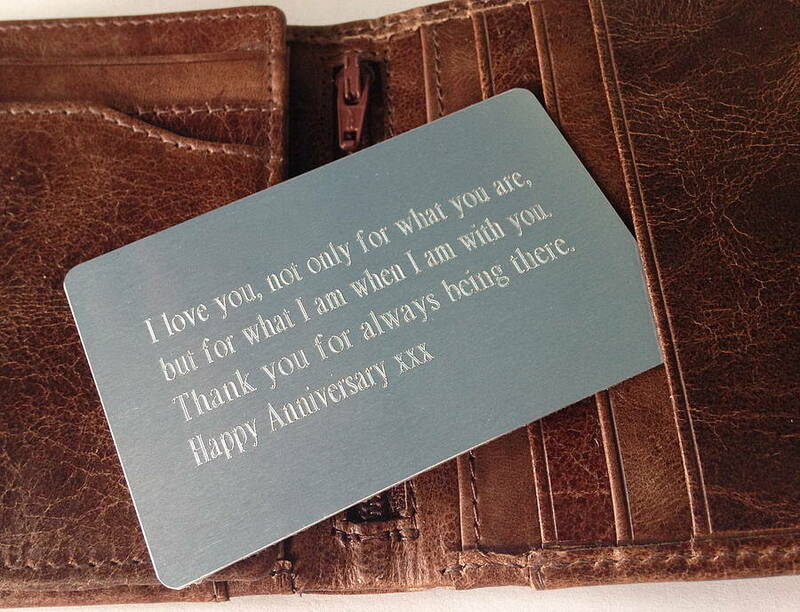 We can also include an engraved heart or star shape in your message. Simply add where you would like it within the text by typing in brackets - e.g. (heart). STANDARD DELIVERY (MAINLAND UK) will be sent via Royal Mail 1st Class post. Please note the ‘receive this item on or before date‘ for this delivery service is an estimation. Royal mail aims to deliver next working day including Saturdays, however this is not guaranteed and can sometimes take longer. EXPRESS NEXT DAY 1PM (MAINLAND UK) will be sent via Royal Mail Special Delivery Guaranteed. Royal Mail sends express items by 1pm the next working day excluding Saturdays. Please note this service requires a signature on delivery. If you miss your delivery, the parcel will be taken to the depot so redelivery or collection in person will need to be arranged by you. This will either be ‘Tracked and Signed’, ‘Tracked’ or ‘Signed’ depending on which country your parcel is being sent to.